This month's newsletter has helpful tips about planning your travel so you can enjoy yourself and not stress out about what you may have forgotten. For many years, I've used a "packing checklist" for trips, even short weekend jaunts - and it has made my life easier. Prior to using a checklist, I remember going on a week-long business trip and to my dismay, realized I'd left all my makeup at home. It was a hassle finding a store in a strange city without a car and repurchasing things I already owned. What a waste of time and money! Forgetting things is no longer a problem when you have a handy cheat sheet, I promise. Well, you still have to wash, fold and shop, but having a list of everything you need for a vacation makes it easier establish a process for your packing and ensures that you remember everything you need. One of my favorite lists for planning a beach vacation (especially one that includes multiple familes or groups) is the Vacation Checklist from Practical Spreadsheets. Download a copy here and you'll never forget the dishwasher soap again! Garmin Nuvi GPS - I wouldn't think of leaving home without it! Hanging Toiletry Organizer - This is a "must-have" in my travel arsenal. The Bag Bungee - This is on my shopping list for the next time I'm at the Container Store. Here's a video of a cool Pack-It System from the Container Store - This is also on my list of things I want/need from the Container Store. I love how you can neatly pack and compartmentalize your things so they don't shift around in the suitcase. A: As of June 8, routine processing time is 4-6 weeks from the time of application. Expedited service is 2-3 weeks door-to-door when overnight night delivery is requested and for both to and from the passport agency. A: First-time applicant fees for adult passports begin at $135 but additional fees may be needed for expedited service and other special requirements or processing. Passports for minors (under age 16) begin at $105. Q: How do I apply for a passport for the first time? A: Depending on your age and residential status, requirements vary. Visit the First Time Applicants page for all the details. Q: Where do I apply for a passport? A: If you have international travel in less than 2 weeks or need to obtain a foreign visa within 4 weeks, you are eligible to schedule an appointment at a one of 24 regional passport agencies in the United States. If you don't need rush service, you can submit your application locally at a Passport Application Acceptance Facility using routine or expedited service. Q: How do I renew my passport? A: Many citizens can renew by mail, but check the Renew Passport page for all requirements. Q: How long is a passport valid and when should I renew my passport? A: If you were over age 16 when your passport was issued, your passport is valid for 10 years. If you were age 15 or younger when your passport was issued, your passport is valid for 5 years. The Issue Date of your passport can be found on the data page of your Passport Book or on the front of your Passport Card. If possible, you should renew your passport approximately nine (9) months before it expires. Some countries require that your passport be valid at least six (6) months beyond the dates of your trip. Some airlines will not allow you to board if this requirement is not met. Plan ahead to avoid stress and worry - and extra fees. Bon Voyage! If you can survive in the wilderness without a hot shower and a toilet, and aren't horrified by the idea of sleeping where bears or large reptiles roam free, then you're probably a practiced camper. But travelers who aren't as comfortable with outdoor accommodations, take heart: camping doesn't have to resemble your week of mosquito hell at fifth grade summer camp. Many campgrounds have running water and public restrooms, or even cabins, lodges or yurts. 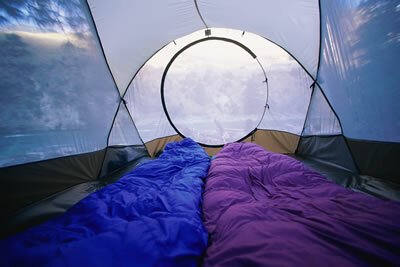 In fact, you may be surprised by how little you miss your everyday conveniences while camping. After all, it's easy to forget about luxuries like 500 thread count sheets and refrigerators when you're gazing at stars over the Grand Canyon, exploring a sea cave in Hawaii or spotting crocodiles in the Everglades. Go camping and enjoy a variety of activities right outside your tent flap -- like boating, fishing, biking, hiking, rock climbing and spotting wildlife. Find inner peace on a forest hike, tone your arms and abs while kayaking, or learn about the importance of protecting the environment as you observe endangered animals in their natural habitats. As an added bonus, campgrounds also offer great value for travelers looking to trim their vacation budgets. Get organized for your camping adventure with the Camping Checklist from Practical Spreadsheets. It includes all the items you need and makes it easy to assign and track who's bringing what on group trips. Ready to hit the great outdoors? Read more.